Ringing the closing bell of NYSE to raise awareness for Hurricane Florence relief. Over the last 7 days, the Greater New York Red Cross provided emergency assistance to 55 adults and 20 children following 37 disaster responses. Here are some highlights from last week and a preview of upcoming activities (see below). Thousands of Red Cross volunteers and employees are working around the clock to provide shelter, food, comfort and other emergency support to victims of Hurricane Florence. Get ground-level updates from some of our local Red Crossers deployed there now: Bruce Vesloski, Josh Lockwood, Brian Gerber, FDNY DART. And watch this video poem tribute to volunteers by Jamillah Abdul-Kareem. On Saturday MNYN teamed up with members of the Florida, NY Fire Department for the most successful Sound the Alarm Event to date! Volunteers visited 63 homes, installed 244 smoke alarms, and educated 175 people about fire safety. Long-time GNY Red Cross volunteer Christophe Lobry-Boulanger moderated an interesting discussion with Dr Jemilah Mahmood of the International Federation of Red Cross and Red Crescent Societies on Friday about the current IFRC engagement during the high-level debate of the UN General Assembly in New York. On Friday, ARC continues to partner with Win to deliver services to the most vulnerable in our society. The masterminds behind the Metro New York Red and White Ball to be held on April 27th met for the first time. Thanks to Fairfield County Look for the fantastic pictures capturing the kick off luncheon. Congratulations to Chief External Relations Officer Desiree Ramos Reiner for being honored by Bergen County at the Hispanic Heritage Celebration for her Red Cross work on Wednesday. Last Tuesday, the Metro NY North chapter hosted its Annual Volunteer Recognition Night. Thank you to all our volunteers for your 24/7/365 compassion and work! 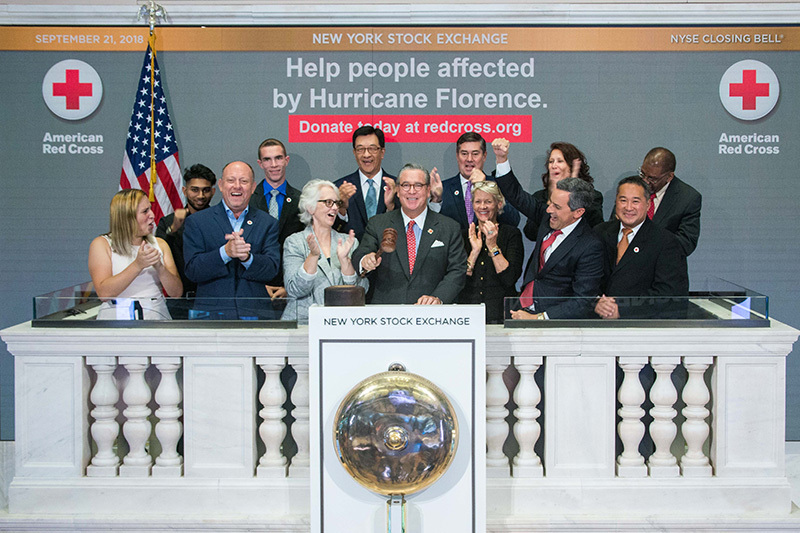 American Red Cross Board Member and Head of Operations at Citibank, Don Callahan, rang the New York Stock Exchange Closing Bell on Monday in honor of the American Red Cross’s humanitarian efforts to support people affected by Hurrican Florence. Watch it here! Oct 2, 5, 8: Red Cross blood drives will take place from 2 to 7 p.m. at the Greater NY Red Cross building located at 520 West 49th Street, Manhattan and other locations. Schedule an appointment to donate today. Oct 10: Join us for the annual American Red Cross: Heroes Among Us gala at the Ziegfeld Ballroom to celebrate the civic leaders and heroic individuals who embody our humanitarian mission. Nov 4: The American Red Cross Greater New York Region is proud to Run for the Red in November at the TCS New York City Marathon. Come be a part of Team Red Cross and sign up by Thursday, September 13! Space is limited, so secure your spot today! For more information, contact Bob Estremera at NYCmarathon@redcross.org or 212-875-2091.